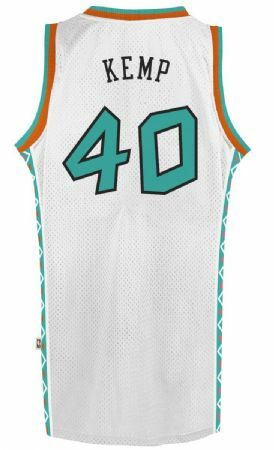 Seattle Sonics Shawn Kemp 1996 All Star Throwback Swingman Jersey. Official Adidas NBA product. The jersey features sewn on tackle twill front word mark, with sewn on player name and sewn on front and back number. NBA logo and Adidas logo is sewn on the top. Screen Printed logos. NBA jocktag on the bottom.